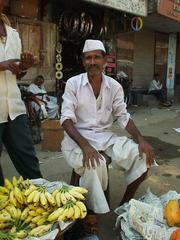 Man selling Bananas in Colaba, Mumbai. Mumbai, 11/2/02, 1:15 a.m. On the midnight ride to my hotel after arriving at the airport, I saw a similar scene to what Twain had described a century before. There were rows and rows of dark-skinned bodies, flopped on carts, on the ground, and on each other, most wrapped in a modicum of cloth, a small slash of white about each waist. It looked like the city had been gassed; this was more like Bhopal than Mumbai. But the dead came to life the next morning. As I walked down the same road at dawn the next morning, was seething with every household function, performed in broad view of passers-by: a man lathering with soap, another squatting to defecate in the rubble on the far side of the street, a woman boiling water for breakfast. Children chased each other in the street, dodging autorickshaws and cargo trucks. Late sleepers still slumbered in their string beds, which were like a four-poster hammocks, rough hewn rods holding up a net of twine. It was like I had walked into a neighborhood of glass walled houses; I was embarrassed to be right on top of all of these basic household functions. To an American eye, it was poverty, but both V.S. Naipaul in and Gucharan Das make reference in their books to "middle class, in the Indian sense", which meant a roof over your head and not wanting for food. By that standard, I guessed this was lower-middle class; these people did not have an air of desperation to them. On the ride in it seemed like all the sleepers were out in the street, but in the light of day I could see that behind them were makeshift houses -- makeshift in the sense that they were built with whatever materials were available, but they also had an air of permanence to them. The street was lined with large acacias, branches spread wide with fern-like leaves which were punctuated with lines of bright yellow flowers. These served as the main pillars of the homes, which were completed with blue plastic tarps, corrugated tin, and plywood. 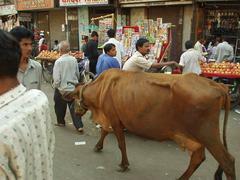 Cow wandering in the Colaba Market. I walked through the southern sections of Mumbai for hours, mostly Colaba and the Fort. It is, as Naipaul said, a crowd; but considering the density of its population, Mumbai is fairly pleasant. For one thing, there are the trees. The acacias spread their arms wide to shade the boulevards, which are frequently very wide, and here and again would rise a massive banyan, frequently two meters or more in diameter, letting drip its arial roots from on high: nothing says "Tarzan lives here" like a banyan. Behind them would slink the shiny banners of capitalism: vines, vines, leaves, pretty yellow flowers, Citibank. The streetside businesses provide perpetual entertainment. Juice squeezers ran stands stacked with oranges, ready to press a glass for a quarter. Barbers set out a chair and proceeded to clip and shave as people walked past. The roofs of drink stands were stacked with sugar cane, which was brought down and run through presses, on the spot, to make beverages. There are always people walking, walking, walking. Perin Nariman street at 7 am is as congested as 880 South from San Francisco to Silicon Valley, except everybody is on foot. The sides the main pedestrian thoroughfares are filled with hawkers selling everything from mutual funds to bananas. Some areas, particularly where tourists are most in evidence, are designated for hawking -- there's a sign, "Hawking Zone", then five blocks later there is another: "No Hawking Zone". In between were dozens of merchants selling belts, drums, Victrola-style phonographs, calling out stock phrases where the words have fused from years of working together: "Helloyes! Havealookmyshop! Schyoozmeester!" Most sidewalks fell somewhere in between hawking and no hawking. The streets were usually less crowded than the sidewalks, and in better repair, so it become a Mumbai habit that everyone walked on the street; the street order, from center out, went: motorized vehicles; pedestrians; (sidewalk began) commercial ventures like the barbers, fruit stands, and shoe shining; street people sitting indolently, sleeping and playing cards, with lean dogs lying amoung them; then the buildings.